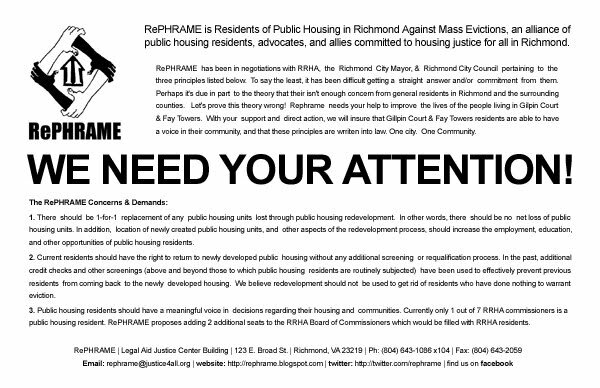 RePHRAME: Residents of Public Housing in Richmond Against Mass Eviction: Print & Distribute! RePHRAME Propaganda! We understand that everyone who cares about any given cause can't always take to the streets and be directly involved with the many many campaigns going on through out their community, but one quick and easy thing we can all do is print out a couple fliers and place them in strategic locations. ie. the office, coffee shop, bulletin board, or even in their own home. Please print and distribute freely any fliers, posters, pamphlets, leaflets, etc found on this site. Also find us on Facebook & Twitter! To receive information on specific actions, meetings, public meetings, forums, etc. 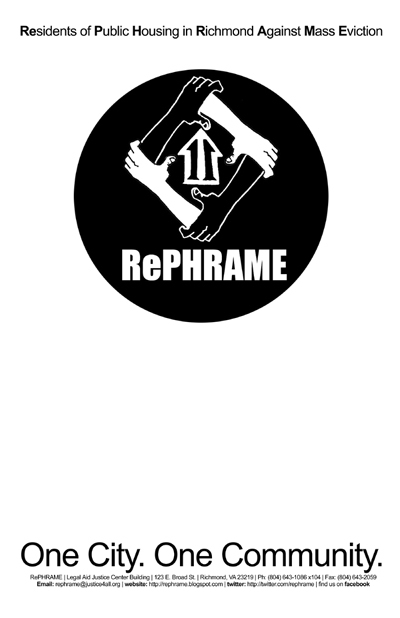 please SignUp for RePHRAME Updates! 1. There should be 1-for-1 replacement of any public housing units lost through public housing redevelopment. In other words, there should be no net loss of public housing units. In addition, location of newly created public housing units, and other aspects of the redevelopment process, should increase the employment, education, and other opportunities of public housing residents. 4. RRHA currently requires that residents mail their rent payment to a SunTrust bank address in Baltimore, MD. Residents must often pay late fees through no fault of their own due to delays in the mail system or processing delays in Baltimore. In February, hundreds of residents paid late fees when a blizzard caused the mail system to shut down. 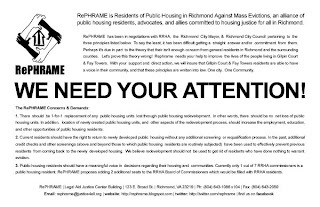 According to RePHRAME's research of dozens of housing authorities in Virginia and nationally, RRHA alone requires residents to mail rent out of state. 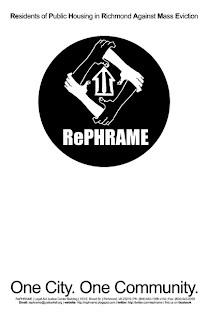 RePHRAME surveyed hundreds of public housing residents in Richmond, and the overwhelming consensus is for a local rent payment option, at either the RRHA rent office in their neighborhood or at a local bank.